Some of the greatest and most loved music by Chopin: G minor Ballade, Four Mazurkas op.17, Nocturne in B major op.9:3, Polonaise-Fantasie, Impromptu in Ab major, Ballade in F major, Barcarolle and the Fantasie in F minor. Chopin Ballade, Debussy Study, music by Albeniz , Szymanowski and Ravel’s Valses nobles et sentimental. A fascinating exploration of the connections between the two Polish composers with Mazurkas, Chopin’s F minor Ballad and Szymanowski’s Studies op.33. …including music by Scriabin, Schumann, Chopin, Grieg, Sibelius, Debussy’s Clair de Lune and Beethoven’s Moonlight Sonata in the complete version. Pianist Petra Casén and historian Dr Nick Slope present an illustrated talk that explores the Russian Nationalist and Romantic Movements in Music and Art of the 19th century. Included is music by Glinka, Balakirev, Cui, Rimsky Korsakov, Borodin and Mussorgsky illustrated with paintings by Bilibin, Ivanov, Repin, Hartman, Vasnetsov and others. The performance will examine the background context and lives of the musicians and artists that made the movement so uniquely Russian. The great flowering of Russian music before and during the Russian Revolution gave artists the dilemma of whether to work for the communist state or strive for personal freedom. 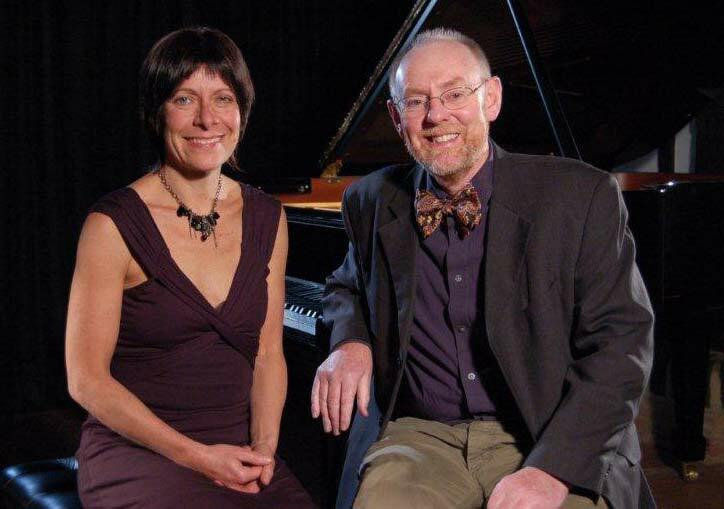 In this illustrated talk pianist Petra Casén and historian Dr Nick Slope discusses the way art and music was influenced by the political changes of the time. Included is music by Rachmaninov, Prokofiev, Stravinsky, Shostakovich and Khachaturian and paintings by artists Kandinsky, Chagall, Roerich, Malevich and Popova. Music inspired by water, including music by Mendelssohn, Bartok, Debussy, Albeniz and Chopin’s masterly Barcarolle. Ballad, Fantasy and Songs…without words. Music by Chopin, Mendelssohn, J S Bach and Rachmaninov. Lyric pieces and Norwegian Dances by Grieg are contrasted by music by Sibelius. Finland’s Sibelius, Denmark’s Nielsen and Norway’s Grieg including the Ballade. …including Chopin’s Fantasy Impromptu, Sibelius’ Valse Triste and music by Mozart, Schubert and Debussy. Following the development of music from 1760 to 1830 through the music of Haydn, Mozart, Beethoven and Schubert. Following the development of music from 1830 to 1890s through the music of Schumann, Mendelssohn and Brahms. Dance-inspired music by Chopin, Mussorgsky, Ginastera, Pieczonka and others. Music written by, for or inspired by children. Includes music by J S Bach, Scarlatti, Ravel, Mussorgsky, Schumann, Mozart, Debussy and Brahms. Youthful love, unfulfilled love and spiritual love. Music by Schumann, Mendelssohn, Brahms, Schubert, Chopin and J S Bach/Hess. Prokofiev’ Second Sonata, Etudes Tableaux by Rachmaninov and Scriabin’s Sonata Fantasy. Music by ‘The Mighty Handful’: Balakirev, Cui, Borodin, Rimsky-Korsakov and Mussorgsky. Music by Debussy, Satie, Poulenc and Ravel. Musical images from Debussy’s Images, Albeniz’ Iberia, Granados’ Goyescas, Prokofiev’s Visions Fugitives and Mussorgsky’s Pictures at an Exhibition. JS Bach/Hess’ Jesu, Joy of Man’s Desiring, Schubert’s Impromptu in C minor D 899:1, Theme and Variations op.73 by Fauré and Prelude, Choral and Fugue by César Franck.